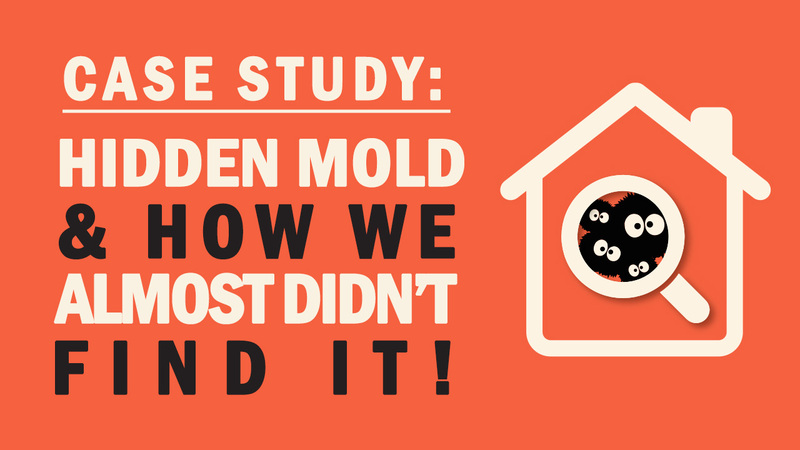 Mold Busters > Local Stories > Hidden Mold – How We Almost Didn’t Find It! Our most frequent calls come from clients who can’t see what the problem is. Sometimes they can smell something abnormal, but don’t have any visible evidence to support why it’s occurring. Other times, there’s absolutely zero signs that can point anyone in any one direction. These are challenging scenarios that we love finding solutions for. These hidden indoor environmental concerns are like cleverly crafted Moriarty plots, and we’re Sherlock Holmes, unravelling the clues, one deduction at a time. Problem: Our client, Diane, was genuinely convinced that there was a hidden issue in her bedroom, but she could not find a single shred of evidence to support it. She learned about air quality testing from one of her colleagues, who referred her to us (thanks Dave!). We dispatched one of our newer technicians to conduct the air quality assessment in her bedroom area. 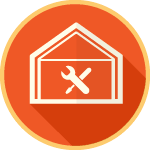 As part of every air quality test, we perform a visual mold inspection, which includes thermal imaging of the exterior walls, moisture readings of building materials, temperature & humidity measurements, and a host of other supporting diagnostics. Our technician was able to note that all diagnostics appeared to be normal; there were no anomalies detected and everything seemed to be normal. There was no visible compromise to the walls or ceiling. No active moisture was detected. There was no carpet or any major textiles in the bedroom area that could be retaining particulates. An inspection of the exterior displayed proper moisture diversion, and grading that was adequately sloped away from the home. The eaves-troughs were in mint condition, and the roof shingles had no signs of compromise whatsoever. Non-viable air quality samples were collected in the bedroom and basement areas, as well as a baseline sample outside. These samples were then to be shipped to a third-party laboratory that specializes in microbial analysis. 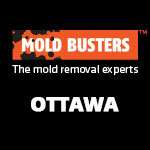 According to our technician’s inspection, all diagnostics were pointing to normal indoor environmental conditions. 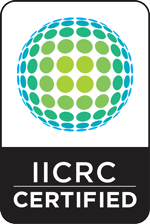 It would have been an understatement to say that we would have been surprised to learn that the air quality data reflected anything different. In two days, the laboratory results were ready. Needless to say, our technician was baffled! According to the laboratory data, there was an elevated presence of Stachybotrys (a toxic mold), and Penicillium/Aspergillus group spores in the bedroom and basement areas – both of which displayed no visual signs of a fungal overgrowth. Also, the home was heated electrically, which eliminated the possibility that spores and other particles were being circulated throughout the home via the furnace system. We contacted Diane to explain the results of the lab report. She seemed somewhat relieved to know that she wasn’t crazy, and that there was a legitimate reason why she was waking up in discomfort. We scheduled a same-day follow-up inspection to identify the source of this fungal presence in her home, and to help her get rid of it, once and for all. We Walked Right Past The Issue – Literally! 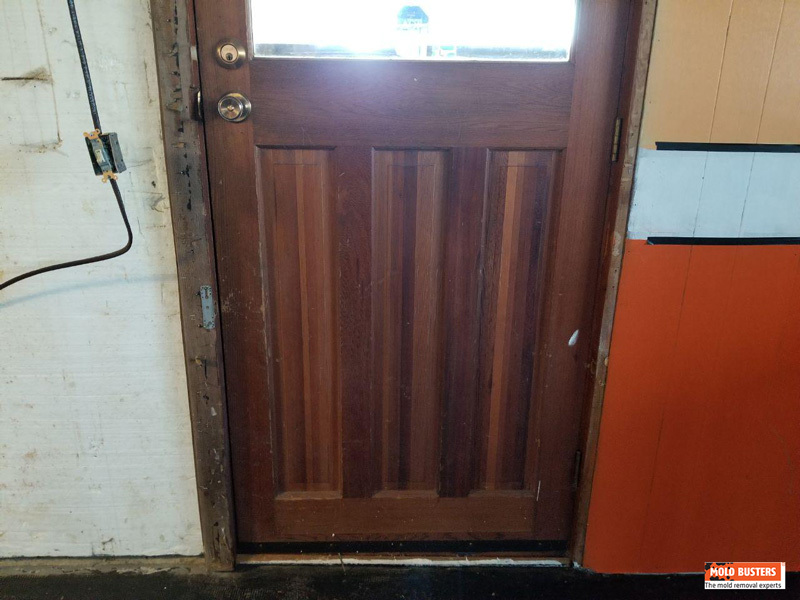 This was the door in her basement area, which led to a semi-exterior mudroom. This was, in fact, the same door that we had to walk through during our first visit to access the rest of the home. There was nothing special about this door, until we had to open it ourselves on our second visit. We found that it was not an exterior door. It was a little flimsy and not as heavy as it should have been. That prompted us to inspect the seals, weather stripping and other components around the door. Surprisingly, nothing was out of the ordinary here too, almost improvements could be made. What We Saw Next Shocked Our Client! Yes, this is the very same door! Looking at the door from an awkward downward angle, and assisted with a high-powered flashlight, we were able to see a fungal paradise growing on the door, hidden in plain sight. Diane was absolutely blown away by this discovery. This was not what she was expecting us to find. The door was not insulated and was exposed to outdoor elements. When it gets cold outside, we heat our inside environment. When hot and cold collides, condensation forms. The collision point here was along the uninsulated surface of this door, which was absorbing the cold outdoor air from one side, and the hot indoor air from the other. 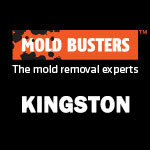 Mold requires a food and moisture source. In this case, it was settled dust and condensation, respectively! 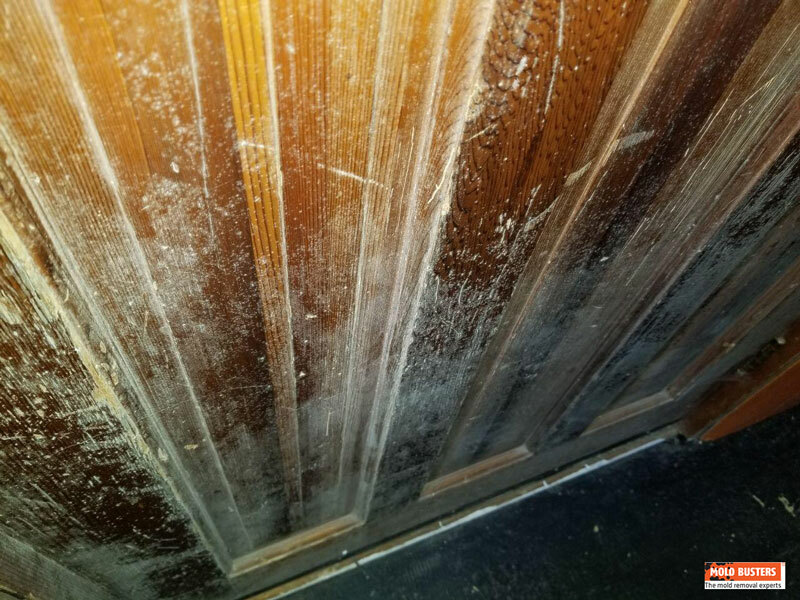 Dust settled onto the surface of the door, and when condensation formed, mold developed on the surface. It continued to propagate as a result of the conditions not changing. Mold is a clever organism, and was able to thrive undetected, hiding in the shadows of this door. It wasn’t until the right light hit it at the right angle that we were able to uncover its cozy hideaway. Back to the bedroom, we turned the light off and closed the blinds. The client stood behind us, waiting for us to switch on our powerful LED flashlights and unveil the hidden spore metropolis that she unknowingly shared a room with. This desk was in Diane’s bedroom. It’s where she spent her time sewing quilts and other gifts for family and friends. 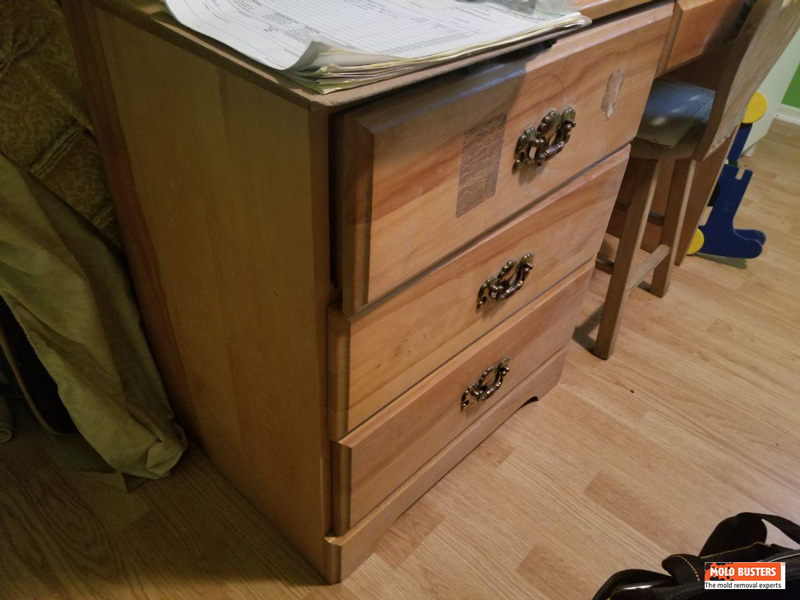 There was absolutely nothing out of the ordinary about this desk. It was not up against an exterior wall, and there was no evidence of water damage, or other problems. In fact, for years, ever since our client got this desk off a free Kijiji ad, she never suspected what we found next. It’s hard to believe that this is the same desk, but it is. Our client was absolutely floored by this revelation. All it took was a different perspective, literally! Viewed from a downward angle, and assisted with a 2,000-lumen light, we were able to observe a fungal colony in full swing. It looked like someone sprinkled icing sugar all over this desk. 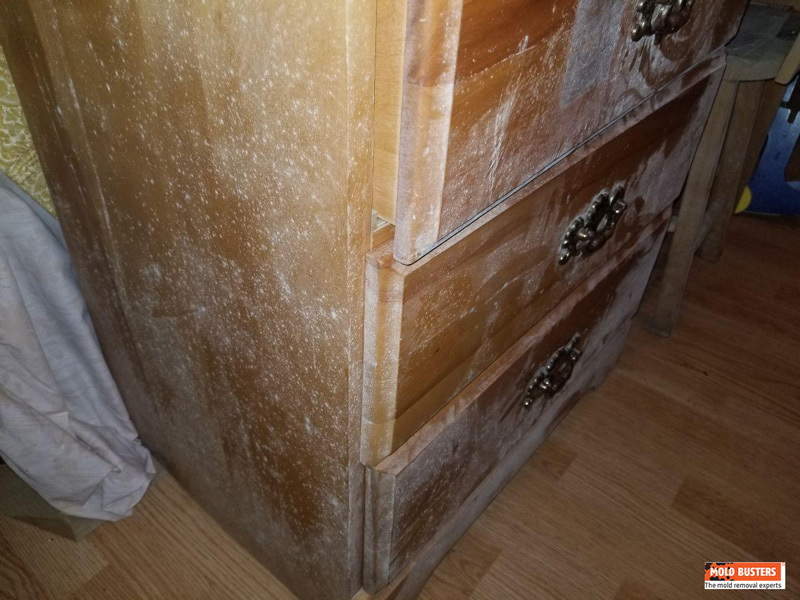 You can even see finger prints on the drawers, where Diane had unknowingly been in contact with this seemingly invisible mold growing all over her belongings. Mold spores easily disperse through the air when in this state, get inhaled, and then cause a host of associated health consequences depending on the individual who is exposed. 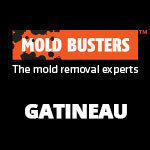 This now visible evidence finally added the clarity we needed to resolve Diane’s mold issue. It wasn’t related to the environment per se. In fact, the home itself was in great shape. We already deduced this when we conducted the air quality assessment. There was no evidence to support an issue originating from the building materials, or construction of the home (aside from the basement door, of course). In the case of Diane’s bedroom, she inherited belongings that were already moldy, and then brought them into her bedroom. The mold stayed undetected and continued to grow, bit by bit, and affecting her more and more as her body inhaled spores every night. How We Fixed It: With her permission, we removed and disposed of all affected belongings, such as the pictured desk, and basement door. Afterwards, we performed a thorough cleaning of her entire home, using HEPA vacuums, and applications of eco-botanical fungicides on all residual surfaces. 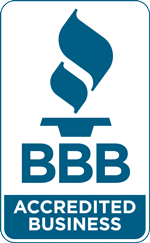 We gave our client some recommendations on what to do help prevent this from re-occurring, and she quickly followed through with the most pertinent ones. 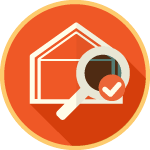 We performed a follow-up air quality assessment, and the laboratory revealed that her home now contained a normal fungal ecology. The problem has been resolved, and Diane is now able to sleep in her room without having to wake up suffering in discomfort as she did before. The culprit almost got away. It was clever, and hid in plain sight, beyond reproach. Insidious in nature, it did what it only knows to do: degrade and destroy. 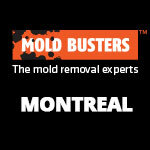 It was, however, no match for Mold Busters. We always find a solution.